TOMRA Sorting Food specialises in the manufacture of sensor-based sorting machines and post-harvest solutions for the food industry. The machines are designed for processing a wide range of products, including fruit and dried fruit, seeds, meat, poultry, gummies, nuts, potatoes, seafood, vegetables and tobacco. 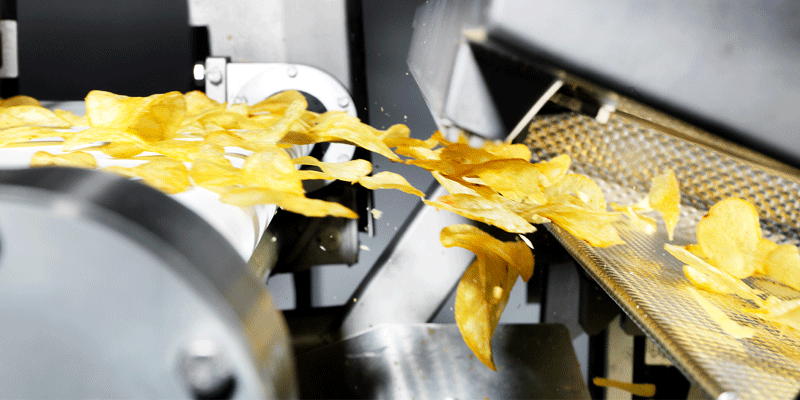 The company’s innovative sorting technologies utilise advanced peeling, analysis and grading technologies to precisely sort products and optimise production flow. TOMRA Sorting Food offers an efficient, high-capacity solution for sorting food products that assures consistently high-quality food. The sensor-based sorting solutions are designed to boost processing capacity and availability, as well as quality and food safety. Their energy-efficient design helps optimise yield and recovery and reduce waste. The Field Potato Sorting Machine (FPS) is a robust potato sorter that removes soil clods, stones and other foreign materials. Its unique vision system precisely separates unwanted materials, including glass, metal, rubber and plastic at high unloading speeds. It has applications with white, brown, yellow, red and purple varieties, as well as seed, processing and speciality potatoes. The Genius™ Sorting Machine is an optical belt sorting machine that utilises multiple sorting technologies for a wide range of food products. 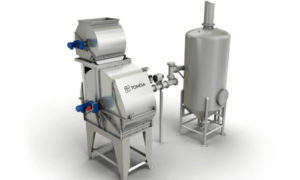 The unit is designed to meet the stringent requirements of the food industry and individual food processors. It removes discoloured products and foreign materials to ensure high food quality consistently throughout its service life. TOMRA Sorting Food offers a wide range of peeling solutions for the removal of skin from vegetables and fruit, including potatoes, carrots, sweet potatoes, swedes, celery, red beets, peppers, pumpkins and chilli. 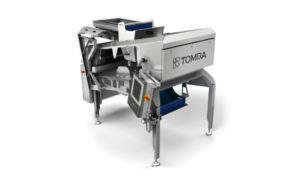 With more than 40 years of experience in potato and root vegetable peeling, TOMRA Sorting Food’s machines can handle between 1,000kg and 65,000kg of product an hour, catering to all production scales. Focus is placed on improving efficiency, yield and food quality, as well as reducing peel loss. TOMRA specialises in inspection solutions with process analytics and in-line analysers. The company has 10,000 food sorters installed worldwide and offers a support and service network. The Blizzard Sorting Machine is a cost-effective unit for processing individually quick-frozen (IQF) vegetables and fruit. It provides consistent inspection abilities to ensure misshaped and discoloured products are removed, as well as unwanted foreign objects. The machine is also easy-to-use with its intuitive graphical interface. The QV-P in-line analyser is designed to quickly identify muscle myopathy in chicken fillets, removing them from the manufacturing line to improve product quality. The machine utilises multi-spectral lights for processing at high speeds. It can also accurately grade chicken, reducing the need for labour-intensive manual checks. More than 8,000 food growers, packers and manufacturers worldwide have benefitted from TOMRA Sorting Foods’ sorting, peeling and inspection solutions. The company aims to improve its client’s returns, operational efficiency and food safety through the prevision of sophisticated, innovative technologies. TOMRA Sorting Food is a member of the TOMRA Group. The company has installations is more than 80 markets, reaching revenues of Nkr7.4bn. The group focuses on providing innovative solutions within its Collection Solutions and Sorting Solutions business areas. TOMRA’s sorting solutions help increase the yield of produce by around 10%, which is the equivalent of 25,000 trucks of potatoes every year. TOMRA Sorting Food operates centres of excellence, regional offices and production facilities within the US, Europe, South America, Asia, Africa and Australasia. Supermarkets of the near-future will have their business models radically re-shaped by innovations in-store, online and in the food industry supply chain. BBC Technologies has extended its turnkey blueberry line with the new Tray Tipper, which automates delivery of fruit into its industry defining KATO260 sorter, optimising its performance. More than 30 journalists worldwide and an international crowd of industry professionals attended TOMRA Food’s press event at Fruit Logistica Berlin, one of the leading global trade fairs for the fresh fruit and vegetable business. Swizzels Matlow has chosen TOMRA’s Nimbus optical sorter to automate the sorting process of its Drumstick Squashies to meet fast-growing demand while ensuring the consistently excellent quality of the product. TOMRA’s president and CEO Stefan Ranstrand has achieved an international accolade in recognition of his leadership and corporate strategy. On 18 January, Westfalia Fruit Colombia inaugurated a new processing plant for Hass avocados in Sonsón, in the department of Antioquia, Colombia. 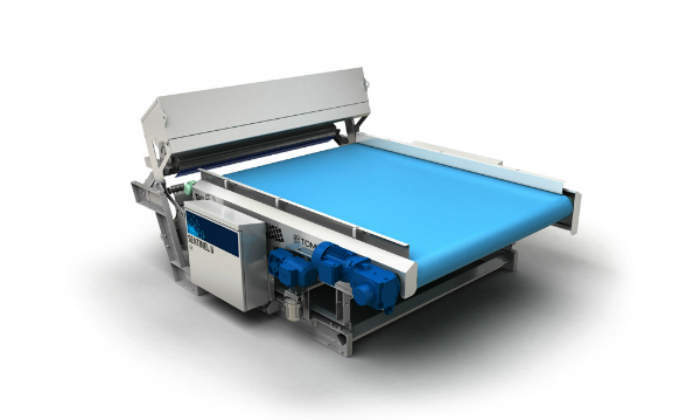 BBC Technologies is extending its CURO filling system with the new CURO-2 compact system for fruit under 40mm diameter, primarily focusing on blueberries, cherries and snacking tomato markets. Bright Light Agribusiness has selected TOMRA Food as its partner for an end-to-end almond sorting solution. TOMRA has announced it has further strengthened its set-up in China by increasing its investment and business activities. Food businesses will have to change to stay competitive online, in-store and at sorting and processing plants too. Director of business development food at TOMRA Food Bjorn Thumas looks at what we can expect. Industrial software provider AVEVA has announced a new partnership with TOMRA to embed supervisory control and data acquisition (SCADA) technology in sensor-based sorting and packhouse solutions for the fresh produce industry. Cavendish Farms is one of the largest processors of frozen potato products in North America. It is equipping its new, state-of-the-art production facility in Lethbridge, Alberta, with TOMRA’s Eco steam peelers. TOMRA Food's Compac has launched the Sizer Simulator, a unique simulation tool that enables fruit and vegetable packhouses to upskill operators and prepare for incoming fresh produce batches. TOMRA announced the appointment of Felix Flemming to head of digital for TOMRA Sorting Solutions. Consumer demand has driven some of the biggest health food trends over recent years, including chia seeds in 2012, the year of quinoa in 2013 and the rise in popularity of avocados in 2015. TOMRA Sorting Food has announced the appointments of two highly experienced senior salespeople for Europe, the Middle East and Africa (EMEA) to further implement its controlled growth strategy. What is Sustainability in the Food Industry? With a rapidly expanding global population and limited food supply, it’s vital for food businesses to work more sustainably and stay profitable. GRIMME Group has joined forces with TOMRA to integrate TOMRA Field Potato Sorter (FPS) into the RH Combi to create the GRIMME PowerCombi solution. Global demand for exotic fruit is rapidly increasing. Today, the worldwide fruit puree concentrate market is valued at more than $400m (€332m) and is expected to grow to $700m (€581m) by 2026. Fevita Hungary is one of the country's largest frozen food producers and a global exporter, with 200 employees processing more than 32,000tn of vegetables every year. Last June, Oliveira Pinho & Filhos purchased a Sentinel II optical food sorter from TOMRA. TOMRA Sorting Food has launched new websites in Turkish and Italian to provide dynamic online resources for its customers. SnowValley Agricultural Group and Aviko Group have decided to join long-term processing partner TOMRA Sorting Food for the development of a new state-of-the-art French fry processing facility. From 3 July to 7 July, the National Technological Centre for the Food and Canning Industry (CTC) in Molina de Segura (Murcia) hosted the Conference on Optical Sorting of Whole Vegetable Products. TOMRA Sorting Food has announced a positive six months trading since the start of 2017 due to a successful launch of three sorting platforms, new senior management appointments, and the implementation of an enhanced customer support service. TOMRA Sorting Food has launched a Korean language website to provide a dynamic online resource for its Korean-speaking customers. TOMRA Sorting Food has unveiled new graphical user interface (UI) TOMRA ACT to help food processors get the most from their sorting systems by optimising work flows and reducing waste to deliver improved profitability. TOMRA Sorting Food has launched new modular service profile TOMRA Care to help satisfy customers' changing service needs and meet new ways of thinking about service in general. Killing an estimated nine million people a year, with rising mortality rates, cancer is the second leading cause of death in the world. TOMRA Sorting Food is providing Portuguese-speaking customers with the latest company news, product innovsations, and event updates with the launch of its new Portuguese website. TOMRA Sorting Food has delivered one of the world's highest capacity steam peelers for a leading potato processing company. TOMRA's new FatScan fat analyser allows for the continuous analysis of meat to precisely determine its fat content. TOMRA Sorting Food has announced it will be present at Interpack 2017 in Düsseldorf, Germany. Since its founding on 1 April 1972, TOMRA has progressed from being a pioneer in automated recycling technology to a company offering a diverse range of sensor-based solutions that are helping to lead a cross-industry revolution toward resource sustainability. TOMRA Sorting Food's Steam Peeling Line has been chosen by Mrs Gerry's Kitchen as part of its latest expansion. Kangfa Food attaches great importance to food quality, which is why the company has introduced various measures to control food quality throughout the entire processing chain, starting from the source. The following article by TOMRA Sorting Food's engineering manager Dr. Doug Reid discusses the measuring and improvement of energy efficiencies for corporate sustainability. TOMRA Sorting Food has announced it will showcase the TOMRA 5A, its newest state-of-the-art potato sorter, at the new biennial processing event ProFoodTech. Dutch company specialising in fries and potato products Farm Frites has been presented with a charity voucher worth €2,000 after winning The Golden Fry competition held by TOMRA Sorting Food. TOMRA Sorting Food has revealed its new way of naming food sorting machines for simple identification. Head of product management at TOMRA Sorting Food Roel Molenaers has brought to attention research by the Food and Agricultural Organization of the United Nations (FAO), which predicts in order to meet the global population's growing demand for food, worldwide food manufacturing and processing industries need to increase total output by 70% by 2050. 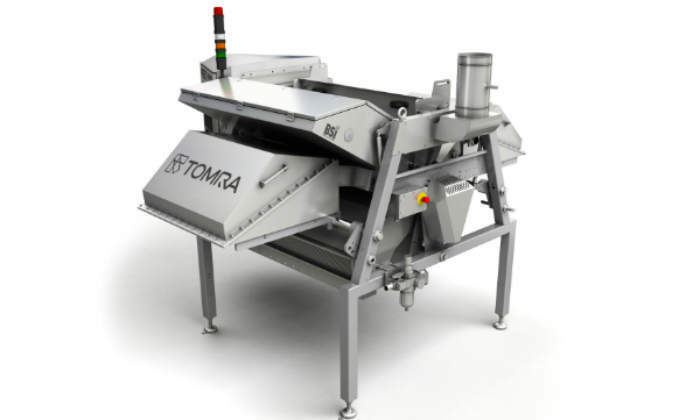 TOMRA Sorting Food is set to launch its new potato processing machine TOMRA 5A at Pack Expo in Chicago. Greenyard Frozen has received a €3,500 charity voucher after winning a competition by TOMRA Sorting Food. TOMRA Systems has signed an agreement with the owners of Compac Holding for a 100% share in the company. TOMRA Sorting Food has announced it will unveil a new state-of-the-art sorter for the vegetable processing industries at SIAL in Paris. A subsidiary of the Kobe Bussan Group, Hata Foods manufactures frozen food, chilled side dishes, and PET-bottle products such as salad dressings and sauces. TOMRA Sorting Food has increased its online presence with the announcement of its new Polish language website. In the Northern Sacramento Valley in 1904, Andersen's began farming cattle, walnuts, and prunes. Today, business is still going strong for the family-owned company now called Andersen & Sons Shelling. TOMRA has announced the release of its new Russian website tomra.com/ru/food, which will provide Russian customers with extensive online resources. Morada Nut is a farm, which specialises in the growing and processing of cherries, onions, bell peppers, and walnuts. Apetit is a producer of fresh and frozen products, which are tasty, healthy, and based on local materials, such as leeks, peas, parsnips, spinach, carrots, swede, celery, and beetroot. TOMRA Sorting Food will showcase its award-winning Nimbus BSI sorting machine at Foodex 2016, the UK's premiere event for the food and drink processing, packaging and logistics industries. TOMRA Sorting Food has reached an important milestone in its history. 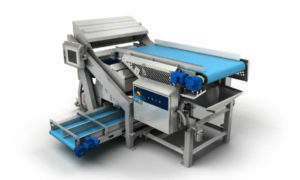 TOMRA Sorting Food is set to showcase its Blizzard free-fall sorting machine for the individually quick frozen (IQF) vegetable and fruit processing market at the 2015 PMA Fresh Summit in Atlanta, Georgia. TOMRA Sorting has appointed Thomas Molnar to the new position of Global Sales and Marketing communications director for its food sorting business. Is Artificial Intelligence the Future of TOMRA’s Resource Revolution? Food sorting machines with the ability to think like humans could solve the greatest challenges facing the industry today, says TOMRA Sorting Food. The common user interface (CUI), designed by TOMRA Sorting Solutions (TOMRA) and Design Partners, received this year´s International Design Excellence Award (IDEA) at a gala ceremony in Seattle, US, on 22 August. TOMRA has launched a French version of its website to showcase to French speaking countries the sorting and peeling solutions the company offers. TOMRA has welcomed two new Chinese customers during a signing ceremony at the 9th World Potato Congress. TOMRA has launched a Spanish version of its website, underlining the importance of Spain and other Spanish speaking countries to the company's global business strategy. Data revealing aflatoxins to be the biggest cause of food-related recalls demonstrates the important role effective sorting and quality analysis systems can play in boosting food safety on the production line, says TOMRA Sorting Food. TOMRA Sorting Solutions has won the 2015 Innovation Award at the World Nut and Dried Fruit Congress in May 2015 at Antalya, Turkey. TOMRA has won the European Business of the Year Award for companies with a turnover of €150m or higher. Visitors to Snackex 2015 will have the chance to question experts from Tomra Sorting Food about their portfolio of sorting equipment. TOMRA Sorting Solutions has installed a new cold room in its test and demonstration center in Leuven, Belgium. 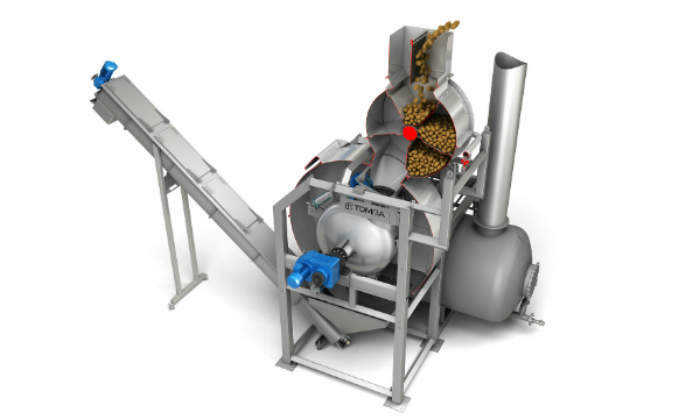 Nut and dried fruit processors, packers and growers can discover the latest technologies and sorting equipment from TOMRA Sorting Food at May's World Nut and Dried Fruit Congress. United Fresh has announced a record 45 fresh fruit and vegetable innovations as finalists for the United Fresh Produce Association's 2015 New Product Awards. TOMRA Sorting Solutions will unveil its new Falcon sorting machine to the US market at United Fresh 2015 from 8-10 June. TOMRA Sorting Food will be showcasing their range of sensor-based sorting systems at the Australian Nut Conference. A visit to TOMRA Sorting's booth at Anuga FoodTec could pay dividends for food processors looking to boost efficiency and production. TOMRA Sorting Food is to show food processors how they can tick all the boxes for food safety, quality and optimal production at this year's Cfia trade show. TOMRA has been named as a Ruban d'Honneur recipient and one of ten finalists now being considered for the 2014-15 European Business Awards in the category 'The Business of the Year with Turnover of €150m or higher'. TOMRA Sorting Food is pleased to announce the availability of the Chinese language version of its website, the newest addition in TOMRA's effort to be closer to the customer and to serve them in their own language. 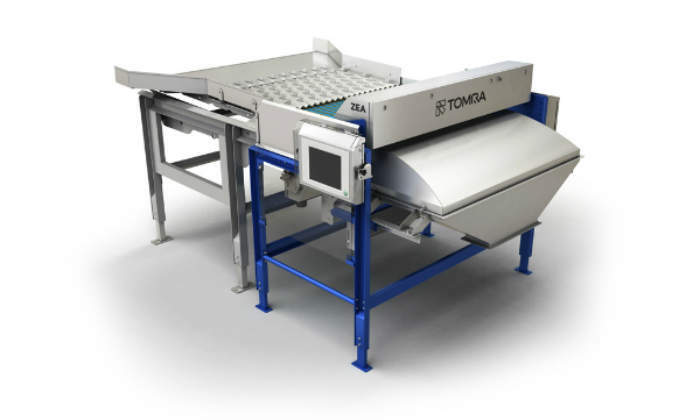 Visitors at Pack Expo EAST 2015 will have the chance to question TOMRA Sorting Food employees about their broad portfolio of cutting-edge sorting and peeling equipment, later this month. TOMRA Sorting Food will demonstrate two of its latest sorting machines for the fresh produce sector at Fruit Logistica exhibition in Germany. Food sorting machines manufacturer TOMRA Sorting Food will demonstrate its popular QVision 500 fat analyser at the International Production & Processing Expo (IPPE) in Atlanta, Georgia, US, later this month. TOMRA Sorting Food will display two of its state-of-the-art sorting machines and its steam peeling XP valve at the Northwest Food Processors Association (NWFPA) Expo and Conference 2015. TOMRA Sorting Food will showcase its innovative Halo sorting system at the largest potato industry conference and trade show in North America, Potato Expo 2015. TOMRA Sorting Food will showcase two sorting machines to almond growers and processors at this year's Almond Conference. TOMRA Sorting Food is set to unveil its latest Modus size grader at INTERPOM | PRIMEURS (booth 110) in Kortrijk Xpo, Belgium, from 23-25 November. TOMRA Sorting Food will showcase its brand new user interface design for the Halo optical sorter at the 17th edition of INTERPOM | PRIMEURS, taking place in Kortrijk Xpo, Belgium, from 23-25 November. TOMRA Sorting Food will be presenting six sorting and peeling machines at the 17th INTERPOM | PRIMEURS exhibition, taking place in Kortrijk Xpo, Belgium from 23-25 November. TOMRA Sorting Solutions and Prologis, a worldwide leader in industrial real estate, today celebrated the grand opening of a 12,600m², BREEAM-certified, build-to-suit facility in Slovakia that is fully customised to accommodate TOMRA's production and distribution requirements. TOMRA Sorting will demonstrate its Blizzard free-fall sorter for the individually quick frozen (IQF) vegetable and fruit processing market at PACK Expo, from Booth 7529, located in the Lakeside Building, Upper Floor, Processing Zone. TOMRA is proud to launch the Falcon, a cost-effective pre-sorter machine for the fresh cut industry. TOMRA Sorting is set to showcase its Halo 500 three-way optical sorter at the largest trade conference and exhibition in the western-world for the fresh food produce industry, PMA Fresh Summit 2014. TOMRA Sorting Solutions has added a second camera module to its ZEA sensor-based sorter, to facilitate the inspection of both sides of whole ear seed corn. TOMRA Sorting in Dublin has created a new centre of excellence for its food optical sorting and peeling business, and is set to improve its research and development (R&D) capabilities after moving to a new facility in Citywest, Dublin. TOMRA Sorting executive vice president and head of sorting Dr Volker Rehrmann advised that the sorting business achieved order intake in the first-half of this year well above that in the initial six months of 2013. TOMRA Sorting, the worldwide leader in sensor-based sorting solutions, has announced its first step in producing a direct worldwide customer-friendly website with the unveiling of its new German language version of its website. TOMRA Sorting Solutions is set to demonstrate the ability of its new sensor-based systems to sort and process potato products at Europe's premier international industry trade fair. TOMRA Sorting Solutions US Food division held its official office opening on Wednesday 18 June, in its new state-of-the-art facility in West Sacramento, California. At Foodpro 2014 TOMRA Sorting Solutions will join Heat and Control at booth N42 to promote its Nimbus free-fall machine, featuring the latest technological breakthrough for nut and raisin processors, and exhibit its QVision 500 analyzer. TOMRA Sorting Food's very strong growth across Asia has led to sales director responsibility for the region being split. Food processing system provider TOMRA Sorting Food has appointed Steven Van Geel as the company's new sales director for China. TOMRA Sorting Food's continuing worldwide growth has resulted in the opening of two brand new facilities and major investments being made at sites in three other countries. 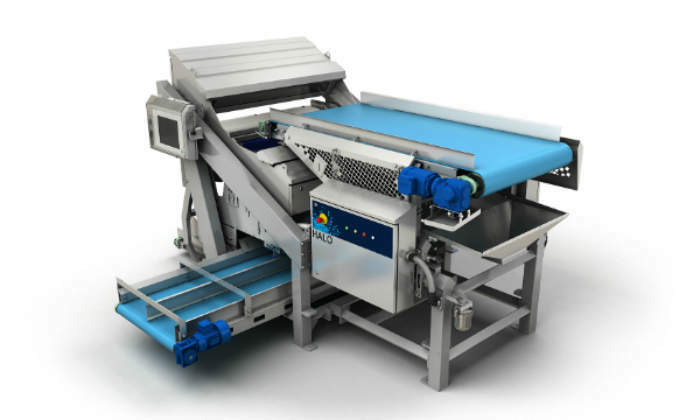 TOMRA Sorting Food has launched its Blizzard free-fall sorter for the individually quick frozen vegetable and fruit processing market, and will be demonstrating it for the first time at Interpack. People attending the Canadian Produce Marketing Association Annual Convention and Trade Show will be able to learn about TOMRA Sorting Solutions' wide range of advanced sorting and processing systems. Attendees at Foodex 2014 will have the chance to hear about TOMRA Sorting Solutions' wide portfolio of leading-edge food sorting and processing systems. A major sensor-based sorting systems provider says American lettuce growers and processors are rapidly adopting its leading-edge technology to substantially increase efficiency and output quality. 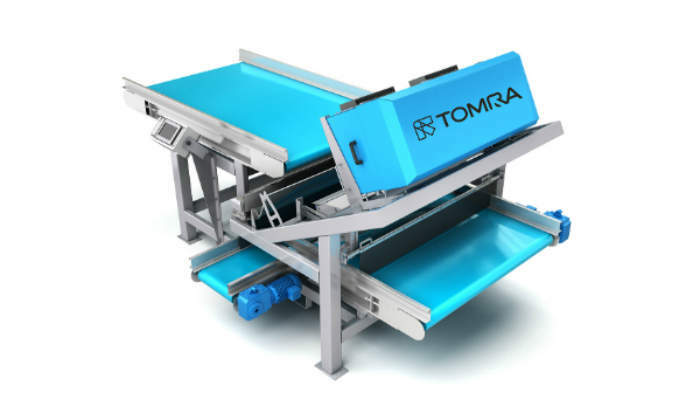 TOMRA Sorting Solutions will feature one of its latest advancements in sensor-based optical sorting of diced and small fruits and vegetables at this year's Food Processing Expo in Sacramento. TOMRA Sorting Solutions will demonstrate two of its market-leading sensor-based systems at this year's Fruit Logistica, the leading fair for the international fresh produce trade. The latest development in steam peeling from TOMRA Sorting is the ODENBERG Eco Steam Peeler. The Eco Steam Peeler is designed to provide further reductions in steam usage and improvements in peeling efficiency. The new product will be launched on the 12th-15th January at the NW Food Processors Expo in Portland, Oregon, US. 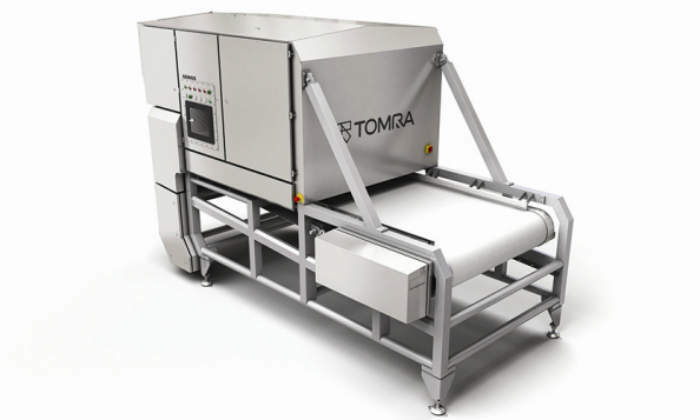 TOMRA Sorting Solutions is to demonstrate how it allows meat processors to secure the maximum benefits from in-line fat analysis and batch control at a major US industry event. TOMRA Sorting Food, a worldwide leader in sensor-based sorting technologies, has entered into an agreement valued at around $3.5m for 2013, to supply sensor-based sorting solutions to a Fortune 500 provider of agricultural products. Sensor-based sorting systems pioneer TOMRA Sorting Solutions has made its latest technological breakthrough for nut and raisin processors available in its Nimbus free-fall machine. The recent discovery of unintended content of horse meat in food products has prompted TOMRA Sorting Food to investigate if its unique transflectance technology could be adapted to detect the presence of horse meat mixed with beef. Last week, BEST opened its fourth BEST Sorting Solution Center (BSSC) in a new building at its headquarters in Leuven, Belgium. BEST also announced two new technological innovations: the Opus and Nimbus next-generation free-fall sorters.